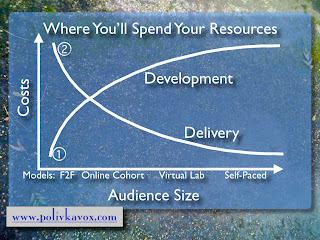 PolivkaVox: How much should eLearning cost? Less. "It costs what? Are you kidding me? I can pay a knowledgeable, competent person a couple of thousand dollars to develop a course and teach it in a classroom, and they're glad to have the money. Why do I need to pay ten times that amount to put the same thing online?" Maybe that's not an internal dialog in your world; maybe it's painfully external. Regardless, the question is, what should it cost? And if it really costs 10 or 20 times as much to put it online, why does it cost so much? I've developed a little chart to help explain what's happening here. Not to explain the cost of instructional designers or learning management systems or multimedia or video streaming. It's to help developers think about where they put their money. Because the reality is, when you decide not to invest in development, you are deciding to invest in delivery. Take a look. 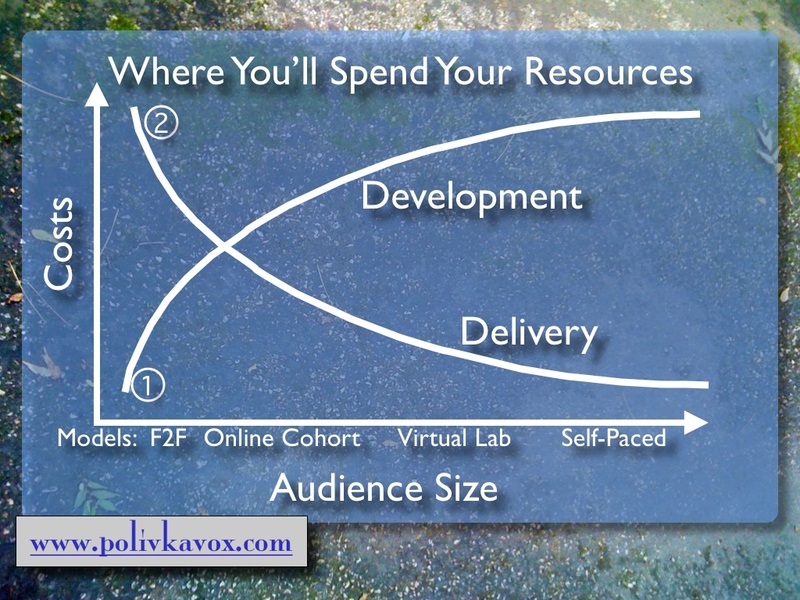 What Line 1 says i s that if you spend very little on development, the way you do when creating a face to face class, you're going to end up spending a lot on deployment, on delivery, unless your target audience is very small. Repeating that class over and over, paying trainers, faculty, maybe travel days, airfares... these costs become enormous over time. And if you just throw the course online for low costs, using the old "shovelware" approach, you'll pay through the nose for support costs and redevelopment, not to mention attrition. Line 2 tells you the opposite. If you spend more on the development, creating it the right way online, you can deliver it to a lot more people a lot less expensively. And of course, a lot more consistently. So you make the choice. Making it with eyes wide open means that you can and should choose your model, and adjust both the development and delivery costs to suit your needs. The classroom, Face-to-Face model gives you the lowest costs for development. The online, Self-Paced model gives you the lowest costs for delivery. Neither one is a good model for everything, but both are effective for something. And then of course you can mix and match the models, building self-paced components into your online cohorts, or adding virtual labs or low-touch facilitation to your self-paced products. My point is not that one particular model is optimal. My point is that if you are going to develop and deliver learning of any sort, you are going to spend your money somewhere. Spend it wisely up front, and you can lower your deployment costs and increase predictability. Don't spend it up front, and you are locked into the high cost of delivery.